ON A pleasant morning when fifty-four-year-old Australian marine diver David Hannan was gearing to plunge into the deep sea, a bunch of American scientists were ready to set sail for the Arctic Ocean. In another corner of the world at Dona Paula in Goa oceanographers were contemplating plans to measure coastal pH along the entire Indian coastline. They all have one concern: ocean acidification—decrease in the pH of the Earth's oceans. Oceans and the myriad creatures face threats from rising sea temperature, overfishing and pollution. Acidification is the least publicised but one of the biggest growing environmental challenges. The hydrogen ion concentrations in the ocean waters has increased by almost 30 per cent since the start of industrialisation leading to more acidic waters. The oceans devour one-third—around nine billion tonnes—of anthropogenic carbon dioxide each year. According to a 2007 Intergovernmental Panel on Climate Change report, the proportions of carbon dioxide in the atmosphere can rise by another 100 per cent by the end of this century if the current trends of greenhouse gas emissions continue. This will result in global mean pH to fall from today’s 8.1 to 7.8 by 2100. The UN climate negotiations envisage a safe limit of two degrees for global warming. This demands capping concentration of atmospheric carbon dioxide (excluding other greenhouse gases) at 350 parts per million. 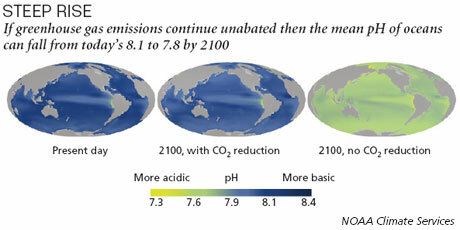 But the UN process has failed to identify a corresponding safe threshold for ocean acidification. The US government took the lead by legislating for action. The Federal Ocean Acidification Research and Monitoring Act, which was passed by the House of Representatives and Senate on March 3 and 19, 2009, called for integrating research efforts into ocean acidification across top scientific institutes like National Science Foundation and National Oceanic and Atmospheric Administration (NOAA) by providing funds. In another move in November last year, the US Environmental Protection Agency (EPA) issued a memorandum, under which 23 coastal states and five coastal territories were asked to monitor ocean acidification under the Clean Water Act (CWA). The Act monitors discharge of effluents into the rivers. This is for the first time a climate change-related issue has been brought under the jurisdiction of CWA. The subject has also never gained a strong foothold in negotiations within the UN Framework Convention on Climate Change. Ocean scientists tried to influence world leaders at the Copenhagen climate conference in 2009. The Monaco Declaration, signed by 155 scientists from 26 countries, warned that ocean acidification has the potential “within decades, to severely affect marine organisms, food webs, biodiversity, and fisheries”. The 2010 Cancun agreement on climate change just contained a single reference to ocean acidification as a footnote. “The Cancun agreement and the Copenhangen Accord did make reference to ocean acidification. But there was no statement detailing how emissions need to be controlled to counter it,” says Timothy Stephens, director Sydney Centre for International Law in Australia. The lax approach to ocean acidification can also be attributed to the fact that its implications are yet not thoroughly documented. Most of our current insights into what might happen to animals comes, from lab experiments. But now many organisations are studying organisms at the sea itself as well. Europe has sported the biggest effort so far. The European Project on Ocean Acidification (EPOCA) was launched in 2008 with the goal to advance understanding of the biological, ecological, biogeochemical, and societal implications of ocean acidification. The USÃ”Ã‡Ãª$22.9-million endeavour integrates research efforts across 32 institutes in 10 countries. “Among many other findings, EPOCA scientists discovered that the uptake of CO2 released by humans will make regions of the Arctic Ocean corrosive to shells and skeletons of organisms that play an important role in the food chain of marine ecosystems,” says Jean-Pierre Gatusso, project coordinator EPOCA. 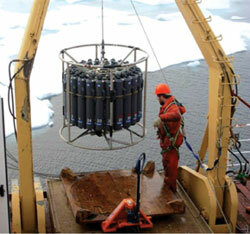 The Arctic has been the prime focus of ocean acidification research as polar seas face increased risk. CO2 dissolves more readily in cold water, resulting in low carbonate saturation.“In particular, results indicate that 10 per cent of Arctic surface waters will become corrosive to some forms of calcium carbonate in less than 10 years and that half will become corrosive by mid-century,” Gatusso adds. In August this year, the US Geological Survey (USGS) in collaboration with St Petersburg’s Coastal and Marine Science Center and the University of South Florida set off on a large-scale expedition to the Arctic Ocean. At the time of the writing of the article, they were conducting experiments on ophiuroid (commonly known as brittle star) in their lab aboard the vessel. The team is trying to figure out whether the Arctic’s waters are dissolving the star’s skeletal plates. The NOAA and Pacific Marine Environmental Laboratory (PMEL) are monitoring coastal and open ocean pH around the US. The team was instrumental in bringing forth the fact that there has been a drop in pH in the open ocean. National Oceanography Centre in the UK completed its cruise across the European waters in July. Back home, the National Institute of Oceanography (NIO) is slated to launch a programme for measuring pH along the country’s coastline by next year. “This will be the first large scale ocean acidification research programme in India,” says N Ramaiah, senior scientist at NIO. So far, to control the menace of acidification oceanographers across the world have tried iron fertilisation. The process involves dumping iron into the ocean to promote algal bloom. The bloom then consumes CO2 in the water. When these algae die, they descend to the seafloor, locking away the carbon for centuries. But studies have found that the process may give rise to harmful algal blooms. Also, carbon absorbed by phytoplankton does not easily get to the ocean floor. “It is thought fertilisation could sequester significant amounts of carbon. But it may only account for a small fraction (<20%) of the required reductions to stabilise climate,” says Anand Gnanadesikan, oceanographer with John Hopkins University in the US. Tracking this carbon would be difficult as the effectiveness of fertilisation depends on how iron cycles work in the ocean, something that is poorly understood, he adds. “If fertilisation were to move carbon into the deep, it would reduce oxygen at these depths and increase deep acidification,” Gnanadesikan notes. The case against ocean acidification is built around the argument that even a 0.5 unit fall in pH will play havoc with marine biodiversity. But scientists say other factors like sea surface temperature, evolutionary adaptation and availability of food also play a part in the survival of the marine organisms (see ‘Not just a carbon curse’). While burning of fossil fuels is attributed as being the biggest cause for acidifying oceans, it is often argued that pollutants like industrial effluents add to the problem too. “We cannot overlook the impact of effluents and untreated waste being dumped into the oceans. While not all of these chemicals may hasten ocean acidification but some of them can acidify seawater in the long run,” says Ramaiah. These chemicals do not contribute to global ocean acidification though, he adds. There is sufficient evidence of localised acidification in India. Data from Coastal Ocean Monitoring and Prediction System shows that waters off Versova in Maharasthra had a low pH and dissolved oxygen was negligible. According to union ministry of earth sciences’ 2010 annual report, water quality at Thane creek indicated that organic load was being discharged in the water body. The pH at Kerala's Veli region was normal, even though the region had untreated acidic effluents. 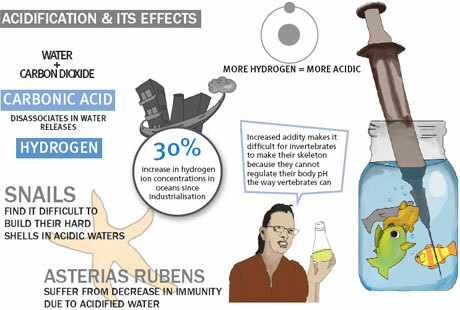 A slew of international studies also illustrate that freshwater inputs, pollutants from industrial plants directly poured into the sea can acidify water. As part of a 2008 study, scientists at University of New Hampshire in the US discovered that Kennebec River plume was putting acidic water in the Gulf of Maine. In America's largest estuary, the Chesapeake Bay, pollution from sewage systems was acidifying the more saline regions of the waterbody, jeopardising the health of oysters, according to a Oregon State University study in 2009. “What ocean acidification will do is not understood well. Concern is that it may affect some species but not others. For example, larvae which do not regulate their pH may be vulnerable while adult fish that have active CO2 regulation may not be,” says Gnanadesikan. In a study published in July this year, scientists at the University of Alabama and University of South Florida in the US simulated ocean environment around 2100 (ph 7.8) and subjected the Gray Sea Star, a tiny organism with five distinct arms, to it. They cut off one of its arm and examined its regeneration. The arm grew to its normal size faster than observed. Scientists from Scripps Institution of Oceanography and UC Santa Barbara drew insights from the upwelling zone in the Californian large marine ecosystem. Large marine ecosystems are regions of the oceans, comprising coastal areas, river basins, estuaries, seaward boundaries of continental shelves and outer margins of the ocean current systems. An upwelling zone is where nutrient-rich and cool water from near the shores is brought up to the surface. Acidity level of upwelling zones is higher than other coastal areas. The team simulated upwelling zone environments in the lab, and found that sea urchin larvae develop normally at pH 7.5, but are significantly smaller. “The larvae were not perturbed by the CO2. They did not die. They were able to tolerate the conditions and continue growing, just at a lower rate, says Pauline Yu, lead researcher of the study, which was published in the June issue of Journal of Experimental Marine Biology and Ecology. The extra CO2 could be considered a “stressful” environment, but not “lethal,” Yu adds. In a lab experiment in January 2011, scientists from Portugal did not find any change in the net calcification, size or weight of clams or freshwater mussels. In fact, they showed reduced mortality at lower pH. Similarly, in 2009 Justine Ries of University of North Carolina in the US, found that lobsters and blue crabs built harder shells in increased acidity.